The Reunion Association is a group of former officers and enlisted men dedicated to preserving the name and memory of the USS Oriskany. 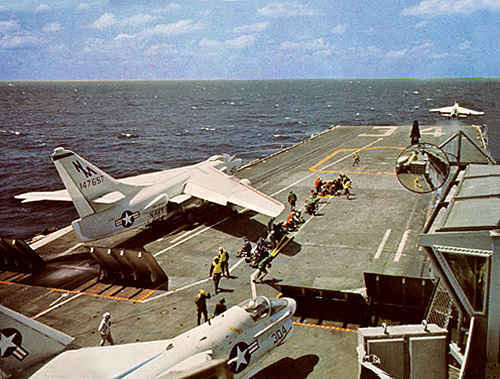 It is open to all crew members, attached air groups and U.S. Marine detachments. The Association holds yearly reunions for the purpose of renewing acquaintances with old shipmates and to carry on our support for the Oriskany Museum. Association dues are just $20.00 annually due January 1st of each year. Please print out the Membership Application and return it to the Secretary/Treasurer at the above address. The next annual 2002 Oriskany Reunion will be held in Tunica, Mississipi which is about 35 miles south of Memphis, Tennessee. (Map). The dates are September 29 through October 4, 2002 at the Hollywood Casino and Hotel. Room rates are $49.00 per night and this price is locked-in only for Sunday through Thursday with check-out on Friday. We have 100 rooms reserved so any time after January 1st, attendees can start making their reservations. We will have a tour of Graceland and a Beale Street tour in Memphis. We will also have a golf tournament. Bus transportation is planned for the reunion. Please contact Phil Cartwright by e-mail for more information. This will be the 52nd anniversary of the commissioning of the Mighty "O". Copyright ©2000 Oriskany Museum, Oriskany NY. 2002 is the 52nd Anniversary of Oriskany's commissioning being celebrated at Tunica, Mississippi.